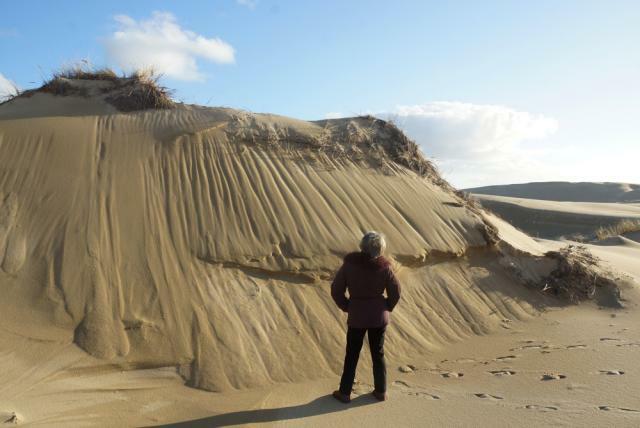 PHOTO CAPTION: A visitor contemplates an unusual sand formation in the Oregon Dunes National Recreation Area. Before I continue the story, however, I must admit that people are correct when they point out that we're all invasive species. It's just that some are more robust than others. For example, if nothing is done about the Oregon Dunes, resource officials say they'll be overgrown in less than 75 years. This chilling prediction led to the formation of the aforementioned collaborative effort, known as Save the Oregon Dunes. Sharing details of their efforts is Florence-based Dina Plavis, USFS volunteer dunes interpreter, who's made recent presentations at venues ranging from Southwestern Oregon Community College to "Pub Science Night" at 7 Devils Brewery in Coos Bay. She'll speak at the June 4 First Tuesday Talk at Coos History Museum in Coos Bay, among other places. At the presentations, Dina explains European beachgrass was planted from the 1930s to 1950 to stabilize embankments at the mouths of coastal rivers so they wouldn't silt in. Their roots consist of fibrous rhizomes that aggressively spread and overwhelm other species as well as open sand. Forest Service aerial photos show how the Dunes have been steadily getting overgrown through the decades. But why do we care? Dina said the answers take in everything from habitat preservation (there are more than 400 species out there, including the Siuslaw Hairy Necked tiger beetle, fastest insect on the planet) to recreation (ATVers, hikers, equestrians, anglers, boaters and paddlers) to economic stimulus (in 2017 the Dunes were estimated to have generated $271.1 million dollars in visitor spending). In addition to clearing beachgrass and brush, giving presentations, and supporting Forest Service plans – about which more in a moment – Dina said a gratifying aspect is the participation by all user groups, from ATV riders to those who enjoy the Dunes' vehicle-free areas. "We're working together without other agendas, because division doesn't do anything to solve problems," she said. Dina praised the ATV group Save the Riders Dunes for their work parties at the Bull Run and Signal Hill areas in the Dunes. At the 7 Devils presentation, riders group president Leo Cox and treasurer Jody Phillips discussed recent "smash the grass" events in which ATVers show up to do battle with invasives with everything from their ATVs to hand tools to bulldozers. With Forest Service support, the collaborative developed goals of preserving the best of what's left and restoring "landscape-scale" projects to get the sand moving again. The idea was to bulldoze a large swath of land from the foredune through the deflation plain to open sand, followed by spot application of herbicide to preserve the newly-opened area. But the plan was derailed with the discovery of coastal martens – a small, furry mammal that lives in the relative shelter of the densely-forested deflation plain. "They didn't want to divide the marten's habitat in two, creating open sand, because martens don't like to cross open sand as it exposes them to predators," said Dina. It's estimated there are less than 200 martens left, with endangered species designation expected by this summer. So now they'll try plan at Baker Beach at the north end of the dunes and evaluate its results. Dina noted the plan will not affect the 5600 acres of Dunes open to ATVers, except for lowering speed limits in some forested areas, a change actually supported by many ATV users. Meantime, work parties are planned for further hand removal of the invasives. Individuals are also welcome to clear brush on their own. Gorse and European beachgrass must be completely dug out, but Scotch Broom can be trimmed to its crown to kill it. Stack cut brush and leave it to decay, but don't put it on top of the native groundcover plant called kinnikinnick. Space limitations here have necessitated a compressed overview of this subject; for more information, or to sign up for emails, or to make donations, check the website Saveoregondunes.org . The ATV rider group's website is www.savetheridersdunes.com , with further details on their Facebook page.